Thin, juicy and tender, with a golden crust, crisp and light, that’s what a Schnitzel should be and it’s easier to achieve than you may think! You just have to follow a few rules and you’ll be rewarded with a delicious breaded cutlet on your plate. First and foremost, you need good quality meat, fresh and thinly cut, about 4mm / 1/4″ thin. Schnitzel have to fry in a mixture of oil and butter or lard which has to stay hot throughout, otherwise the breading will soak the oil. Try to avoid cutlets which are too thick as they will take too long to get done, they just turn dry and tough. If your cut of meat is too thick, you could also cut it in half yourself and open it like a butterfly. 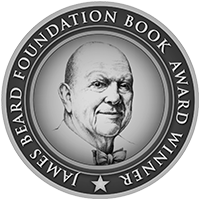 For a more tender texture you should pound the meat lightly with a meat tenderizer or the back of your fist. 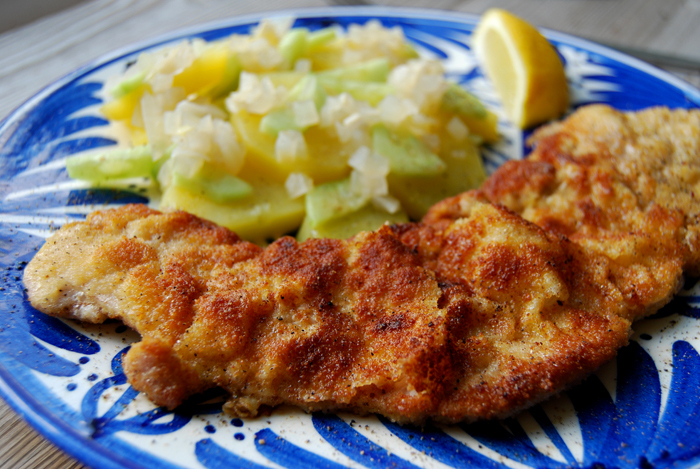 You can either use pork which is very popular or veal, which is used for traditional Wiener (Viennese) Schnitzel. It’s a bit more expensive and I like both. The breading is made in three steps, first you have to turn the meat in flour, then in lightly beaten egg followed by breadcrumbs. The fried crust should be crisp, thin and light, the breading shouldn’t stick to the meat but form light waves around the Schnitzel when it has been fried. 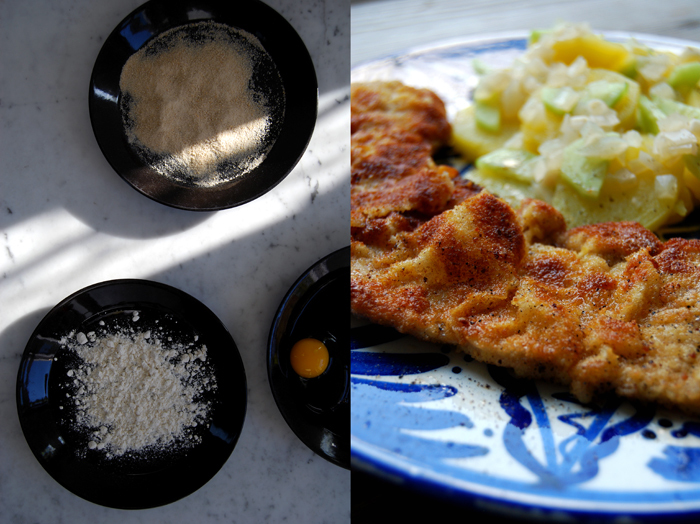 To fully enjoy a Schnitzel and its great crust, I prefer to eat it without a sauce, just salt and pepper and some fresh lemon juice drizzled on top. 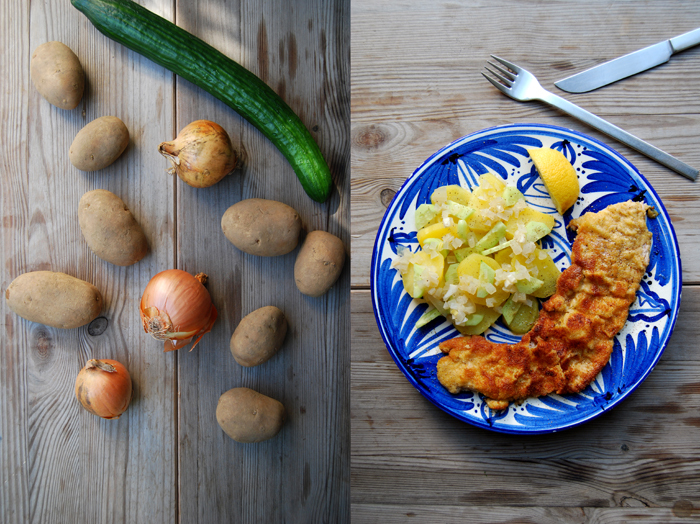 It’s a hearty meal, but not as heavy as the cliché of German food suggests, to keep it light I serve a traditional Swabian potato salad on the side. The sweet dressing is made of lots of finely chopped onions shortly cooked in white Balsamico vinegar and water. I just add some crunchy cucumber and a little olive oil, salt and pepper to the salad. My step father is from Swabia in the South of Germany and he added this salad to our family recipes which is loved so passionately by all of us that we regularly fight over the last bits left in the bowl! In a large heavy pan, heat a generous splash of oil and 2 tablespoons of butter over a high temperature. The bottom of the pan should be covered in fat and allow the meat to swim. I fry 2-3 Schnitzel in my pan at the same time but depending on your pan you may have to fry less. Prepare 3 big and deep plates, fill one with the egg, the other with flour and the last with breadcrumbs. 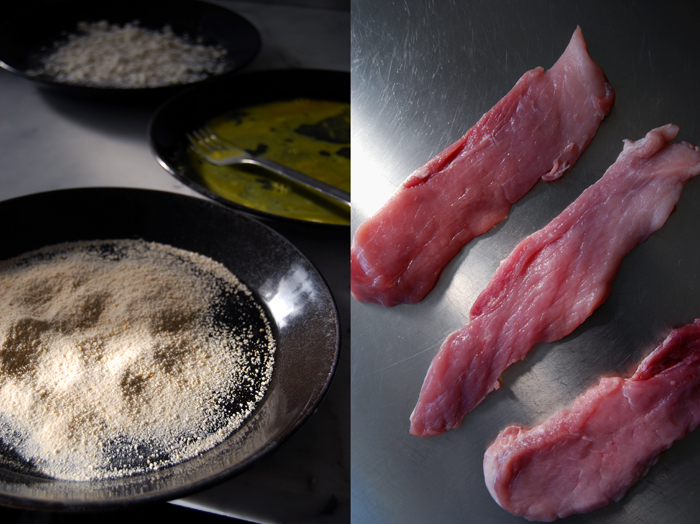 Lightly dust and turn the meat in the flour, turn it in the egg and then quickly in the breadcrumbs until covered. You have to work quick now as you have to fry the Schnitzel and prepare the other cutlets at the same time. Put the breaded meat in the hot pan immediately and fry for 1 – 2 minutes on each side until golden brown. Take the meat out, season with salt and pepper and set aside. Add more oil and butter to the pan and let it heat before you fry another batch of Schnitzel. You may have to add some more butter in between flipping the meat as well. 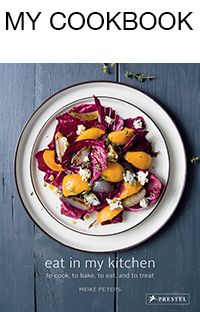 Serve with lemon wedges and Swabian potato salad. In a sauce pan, bring the onions, vinegar and water to a boil. Cook for 3 minutes on medium heat. Take it off the heat, close with a lid and let it sit for 5 minutes. In a large bowl, gently mix the potatoes, cucumber, onions in vinegar, olive oil, salt and pepper, season to taste. The salad tastes great the next day if you manage to keep some leftovers. 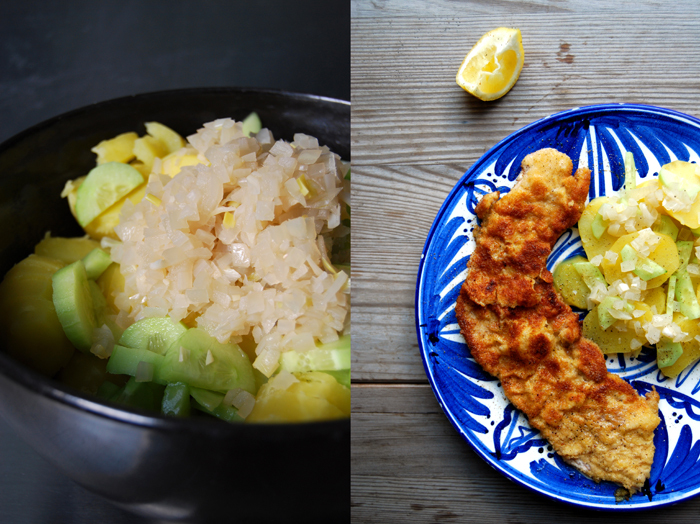 I ♥ schnitzel, but it is so hard to find veal in my area. I usually use pork to make it. The potato salad sounds wonderful, will be trying it soon. I love a good, proper schnitzel and this looks wonderful. It reminds me of being on holiday!